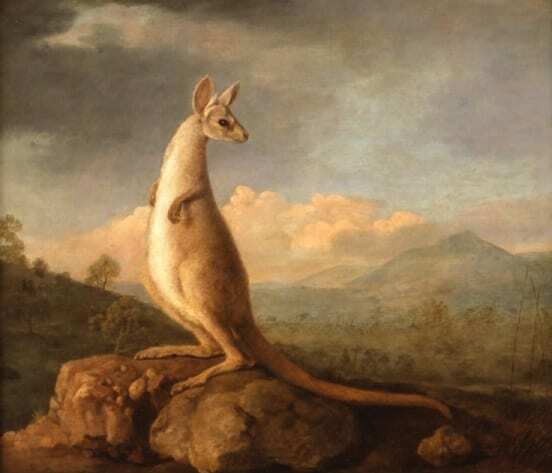 Strange Creatures centres upon George Stubbs’ painting of a kangaroo (pictured above), which was created following Captain Cook’s first Pacific “Voyage of Discovery”. It is Europe’s first painting of an Australian animal and became the archetype for how people imagined this iconic species for decades. This painting was recently saved for the nation after it was initially sold to an overseas buyer. This resulted in a government export bar before Royal Museums Greenwich raised the funds to keep it in the UK (as I wrote in The Conversation at the time). This exhibition represents a chance to see the artwork among other animal depictions from the time of their earliest European encounters. Many of the artworks on display were created by people who had never seen these animals in the flesh, either working from explorers’ accounts, or copying (and potentially embellishing) images produced by others. As a university museum one of our key jobs is to create opportunities for the public to engage with cutting-edge research that is taking place here at UCL (University College London). As such, most of the exhibition’s displays were developed by palaeontologists and by historians of science, exploration and art from the university. They have investigated the theme of animal representation from the perspective of their own disciplines, and developed sections of the exhibition around them. These researchers’ stories include medieval accounts of exotic creatures, art from the ages of exploration and empire, sailors who faked “dragon” specimens by manipulating dried fish, contemporary knitted craft taxidermy and twenty-first century reconstructions of dinosaurs. Together they explore how unknown animals are communicated to the wider public. I spend a lot of time in remote areas looking for animals (I’ve never officially discovered a new species, but I probably have caught animals that are yet to be described). As such, I wince at historic accounts of explorers briefly describing a fantastical animal they encounter, immediately followed by an account of what it tasted like. One of the researcher’s displays explains how food is unsurprisingly prioritised over science in these situations. To be fair, I don’t have to rely on ship’s biscuits or foraging (much) during my field trips, and I don’t spend months at sea to get there. It’s not only historic artworks which mis-portrayed these amazing species. We have all seen taxidermy in museums that is less than perfect. [COUGH-Hornimanwalrus-COUGH]. Such specimens arose when skins were shipped back to Europe and fleshed-out to recreate the animal based on a few notes. Modern dinosaur toys are another example. We’ve known for some time that many dinosaurs were dynamic, warm blooded, intellgent animals, but popular culture is still full of traditional Godzilla-like tail tragging dullards. It’s been such a fascinating exhibition to pull together – being able to work with a group of historians, artists and scientists from such a diverse set of disciplines has allowed us to tell so many stories about the topic of animal representations. It’s also very exciting to see these incredible objects, like Stubbs’ kangaroo, prints and drawings from UCL Art Museum and Captain Cook’s handwritten voyage accounts (from UCL Library Special Collections), displayed alongside the Grant Museum’s animal specimens. Jack Ashby is the Manager of the Grant Museum of Zoology, and curator of the Strange Creatures exhibition. ‘Strange Creatures: The art of unknown animals’ runs from 16th March to 27th June 2015. The Grant Museum of Zoology is open from 1–5pm Monday to Saturday (but closes for a few days around Easter). Admission is free and there is no need to book. We have a fantastically packed programme free events accompanies the exhibition, from drawing classes, open mic nights with performances from animal researchers, tours and Museum Lates to a screening of Skippy the Bush Kangaroo and a Knit-a-thon. Strange Creatures is part of Travellers’ Tails a collaboration between Royal Museums Greenwich and four partner museums to investigate the history of exploration, art and science. It is supported by the Heritage Lottery Fund and the Art Fund.